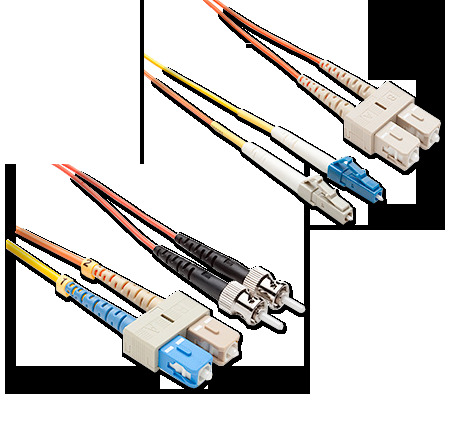 The Mode Conditioning Optical Patch Cord may be with multimode 62.5/125 or 50/125 cables equipped with SC, ST, LC or MTRJ connectors. This specially assembled patch cord is required when Gigabit Ethernet 1000 Base LX routers and switches are installed into an existing multimode cable system. Applied Fiber's Mode Conditioning Optical Patch Cords are built to IEEE standards due to the launch nature of the long wave (LX 1300nm) by transceiver module used for Gigabit Ethernet. Lasers are used in these applications because they function at the baud rates and longer distances necessary. The modules used operate for both singlemode and multimode fibers. Launching a singlemode signal into the center of a multimode fiber will create multiple signals that confuse the receiver at to opposite end. The multiple signals also severely limit the cable distance length for operating Gigabit Ethernet. The mode conditioning patch cord is built to offset the singlemode launch into the multimode fiber creating a launch that is similar to the typical multimode LED launch. Therefore signal distortion is eliminated and system efficiency is maximized.